Last month, I offered my customers a deal for a Simply Scored Class. If they bought the Simply Scored from me, the class fee was only for $5 (just to cover supplies) but if they weren't interested in buying the Simply Scored and still wanted to take the class, the fee was $12. I had a few people take me up on my offer and today I want to share with you the cards that we made at the class. I am currently IN LOVE with the Spice Cake Designer Series Paper from the Holiday Mini Catalog and I just can't stop using it. I am also loving the Pool Party and Soft Suede colors. I think they are soooo pretty! 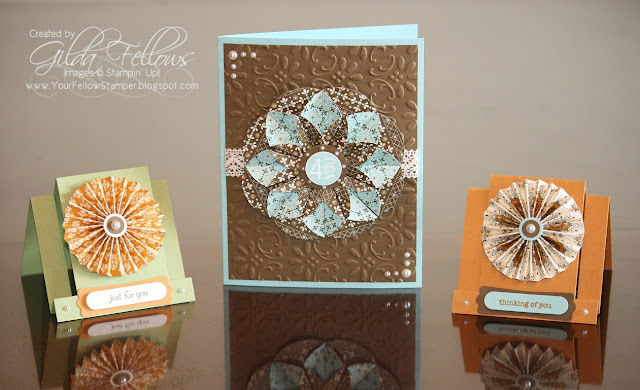 I got the card idea with the Dahlia Fold from Stampin' Connection and the step cards were my original design. The Step Cards are 3x3 cards and having the Simply Scored Tool just made it soooo easy to make. I also used a whole lot of Basic Pearls for these cards. They just made the cards look a little more elegant. To order all the supplies you need for these cards, please visit my online store for your 24/7 shopping convenience. Beautiful cards! What a great opportunity you offered your customers, too! That is what I like about Stampin'Up! Your cards are gorgeous! I especially love the pool party/soft suede card! Gilda what a great idea using the price difference for the class to allow customers some additional options. Your class price is very reasonable as well for these 3 beautiful cards. 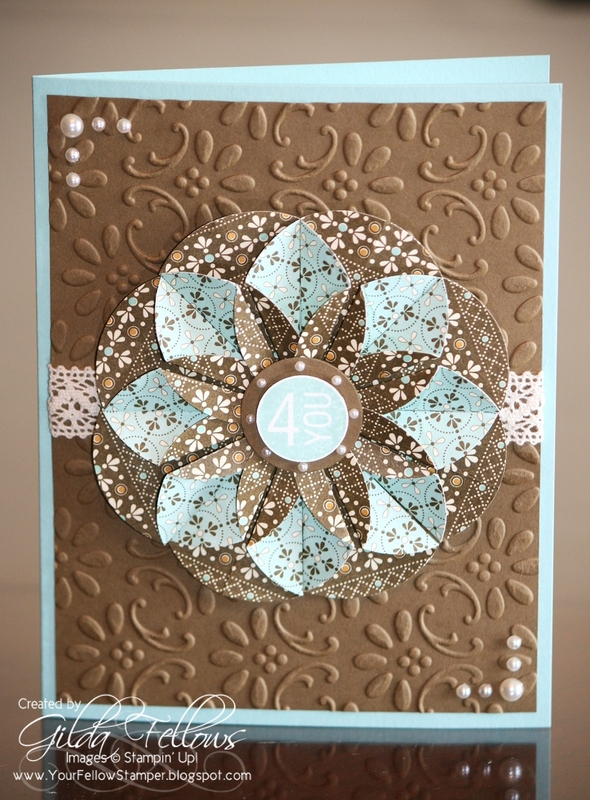 I like the Spice Cake DSP as well and these cards demonstrate how beautiful it looks in any shape. TFS! Gilda! I do so love this set of cards and the brown and blue one is just beautiful! Love the folded circle card. Would you post the tutorial? That would help me (and probably others) decide whether or not to purchase the tool(s).